Following are top 10 videos to kick start on CRM 2011. 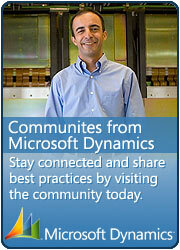 This entry was posted in CRM 2011 and tagged Presentation on March 9, 2011 by mayankp. I have just come across really nice slide show presentation of CRM 2011 which is shared by Jukka Niiranen and thought of sharing with the community. Following is link to two part presentation for the same. This entry was posted in CRM 2011 and tagged Dynamics, Presentation on November 22, 2010 by mayankp.